Tables are a rather unchallenged interface element. In most cases, they are a forgetten element, an undesired element and a seldom-used element. Too bad, because tables have amazing versatility and can be used for multiple purposes. For instance, they can be used to display complex data, pricing tables and calendars, as well as having many other uses. Tables don’t have to look boring, flat and lifeless. 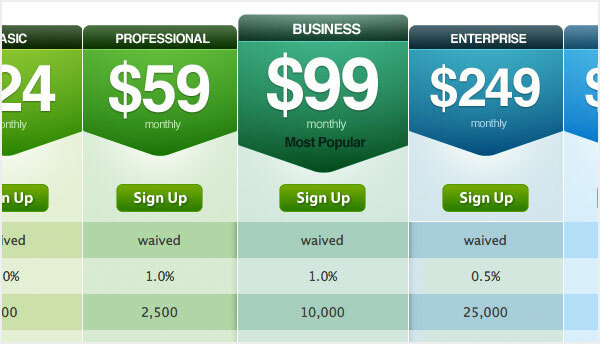 In fact, they can be wonderful design enhancements for your website and pricing sheets. To prove this, I’ve collected some amazing table designs, showing you the endless possibilities they have to offer. I did warned you that tables are great, that is, for showing of your tabular data. Let’s move on with a small collection of tutorials and resources to get you started. To start, you should always define at least 3 elements; table, thead, and tbody. There is also tfoot, but is less commonly used. It should look like this. Then add some basic styling like you would any other element. Next, we should create are areas of comparison by defining table headers; this will sort the information into columns to make it easily comparable. We do this by declaring table header elements inside a new table row. Then add some information on what the columns will hold. Most likely the last thing you will have to do, add content to your table to compare. This is done by adding “td” elements in new table rows. You’re finally done. You can download the source files below and checkout the live preview if you please! Our Testking 1z0-051 online training is the best place to learn about latest trends and tools in web designing. Learn the best designing practices with help of using Testking 642-566 tutorials and Testking JN0-522 resources. This entry was posted on Thursday, March 11th, 2010 at 17:41 and is filed under Inspiration. You can follow any responses to this entry through the RSS 2.0 feed. You can leave a response, or trackback from your own site. Yeah, I know some of them. You forgot the awesome 37signals’ tables in Basecamp/Backpack/Campfire etc. Why showcase this, yes they are good looking. But tables are for tabular content, css just for styling but not for structure of said tabular content. Pointless in my eyes, especially when they aren’t anything “special” in there, just standard you could of seen a few years back. Despite some of these not being actual tables (like Notable’s [oh, the irony!] “table”), this is a really nice showcase.